An origin requests permission from the user to handle payment requests for a set of supported payment methods. For example, a user visiting a retail or bank site may be prompted to register a payment handler from that origin. The origin establishes the scope of the permission but the origin's capabilities may evolve without requiring additional user consent. Information used in the display of instruments supported by the payment handler. The user agent displays a set of choices to the user: the registered instruments of the candidate payment handlers. The user agent displays these choices using information (labels and icons) provided at registration or otherwise available from the Web app. Figure 1 A Web payment app is associated with an origin. Payment handlers respond to PaymentRequestEvents. PaymentManagers manage the definition, display, and user selection of PaymentInstruments. A PaymentInstrument supports one or more payment methods. The PaymentManager is used by payment apps to manage their associated instruments and supported payment methods. The user agent is NOT REQUIRED to prompt the user to grant permission to the origin for each new supported payment method or new payment instrument. When displaying payment handler name and icon, the user agent may use this string to improve the user experience. For example, a user hint of "**** 1234" can remind the user that a particular card is available through this payment handler. When a agent displays all payment instruments available through a payment handler, it may cause confusion to display the additional hint. The PaymentInstruments interface represents a collection of payment instruments, each uniquely identified by an instrumentKey. The instrumentKey identifier will be passed to the payment handler to indicate the PaymentInstrument selected by the user, if any. The second bullet above may be amended to remove explicit mention of ordering defined by the payee. The Working Group is discussing how default payment instrument display could further streamline the user experience. These use cases are best supported by the provider publishing these payment handlers using different sub-domains and therefor under different origins. An earlier version of this specification included a feature for grouping payment instruments in to wallets within a single origin. The WG resolved to remove this and postpone implementation of such a feature until a later version of this specification, and pending market feedback that reinforces the need for it in place of other mechanisms such as sub-domains. This attribute indicates the total amount being requested for payment. It is of type PaymentCurrencyAmount dictionary as defined in [ payment-request ], and initialized with a structured clone of the total field of the PaymentDetailsInit provided when the corresponding PaymentRequest object was instantiated. This attribute indicates the PaymentInstrument selected by the user. It corresponds to the instrumentKey provided to the PaymentManager.instruments interface during registration. An empty string means that the user did not choose a specific PaymentInstrument. For each PaymentInstrument instrument in the payment handler's PaymentManager. instruments, add all entries in instrument.enabledMethods to registeredMethods. Set the paymentRequestId attribute of e to the [[details]]. id from the PaymentRequest. Set the instrumentKey attribute of e to the instrumentKey of the selected PaymentInstrument, or an empty string if none was selected. If url's origin is not the same as the service worker's origin associated with the payment handler, return a Promise resolved with null. If event. [[windowClient]].visibilityState is not "unloaded", reject promise with a DOMException whose name is "InvalidStateError" and abort these steps. 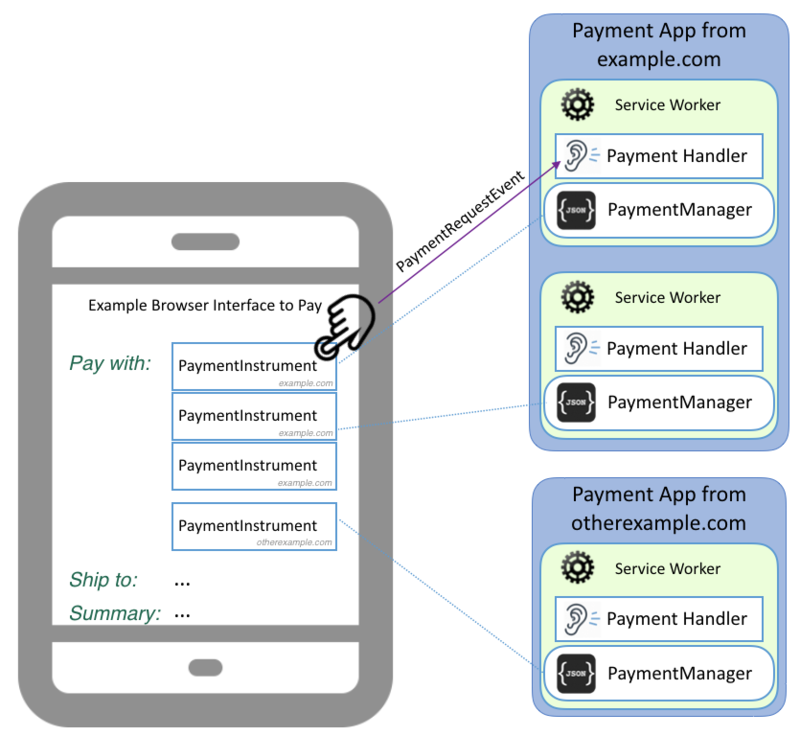 The terms payment method, PaymentRequest, PaymentResponse, supportedMethods, PaymentCurrencyAmount, paymentDetailsModifier, paymentDetailsInit, PaymentMethodData, ID, show(), and user accepts the payment request algorithm are defined by the Payment Request API specification [ payment-request ].